Unbelievable but all those Bible labels that were printed out yesterday plus all the mail we had today got processed. 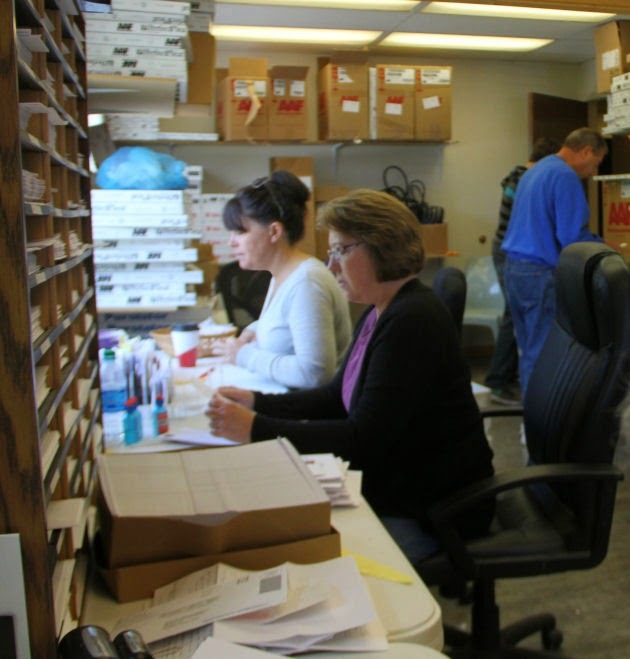 In fact we were able to fill every request to the individuals but the only way was to call Ellen to see if she had any that had been returned. She came up with 6 Bibles and that was exactly what was needed. 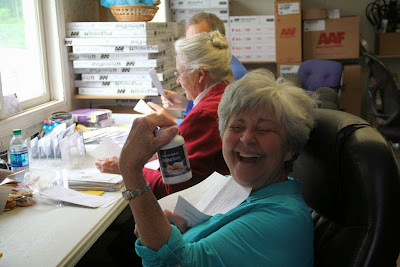 All together we sent out exactly 300 Bibles this week. Two more pallets were ordered. Hope they arrive by Tuesday. The pictures below are of this weeks workers, both Tuesday and Thursday since I finally got time to download them off the camera. 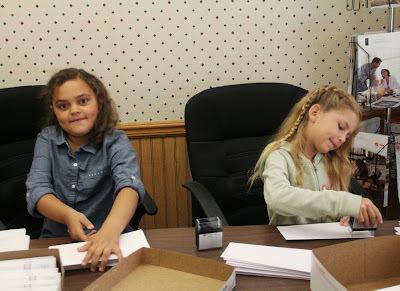 Above Ava and Faith are stamping envelopes, below Mackenson and Berlica are also stamping envelopes while Hannah stuffs the boxes. 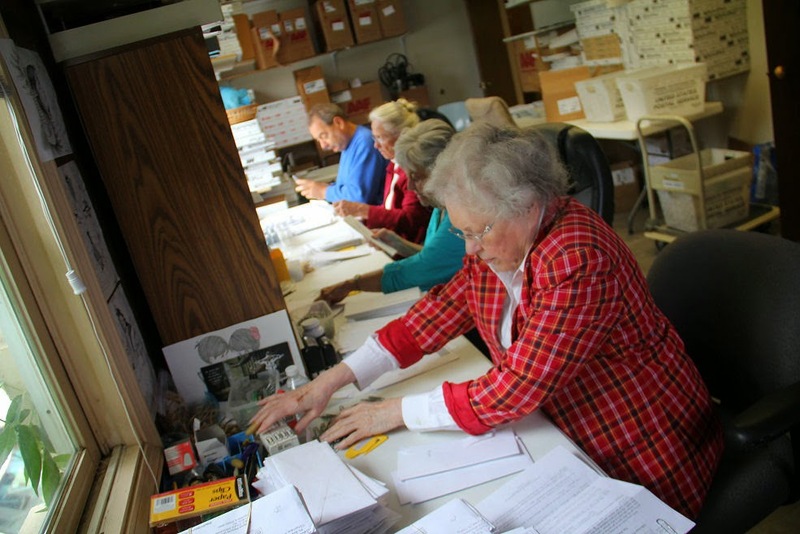 Above are just a few of the piles of mail that came in on Tuesday and below is the great Tuesday crew all busy opening, reading and processing the mail. front to back is Eva Jean, Shirley, mom and Dave. Above Shirley was wondering why someone brought down a bottle of vitamins and burst out laughing when we explained they were paper clips. Our paper clips come back to us in all kinds of containers. 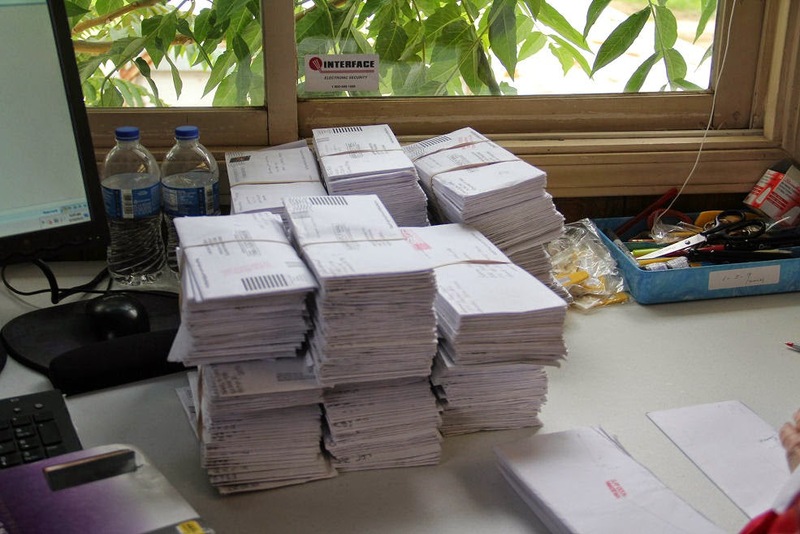 Below Chuck is busy applying labels on envelopes then the envelopes onto the studies. The next few pictures were taken today, we had a hard working bunch come in for our Thursday work. Emily, Dave and Logan are working on getting the Bibles ready for mailing. While Rachel and Diane R are busy reading the mail. Emily is busy stacking the Bibles back into the boxes to transport them out to the truck. 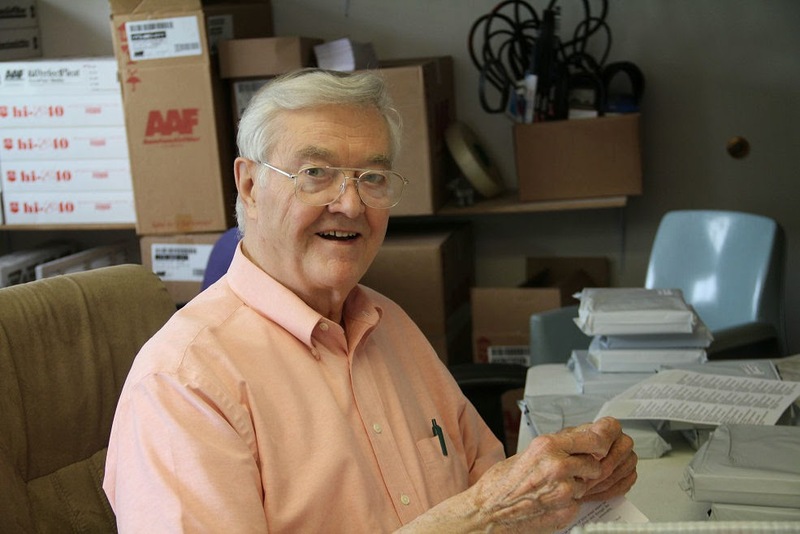 Below is our work train we set up to pack all 25 boxes of Bibles into the truck. We put everyone to work around here. 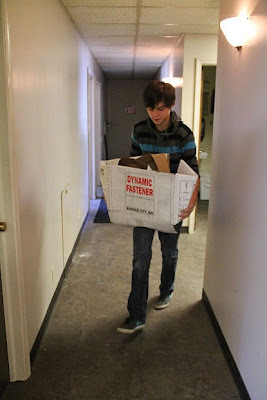 We love it when we get young volunteers to do the hauling and lifting. Below Logan is on garbage duty. He was busy crushing boxes. 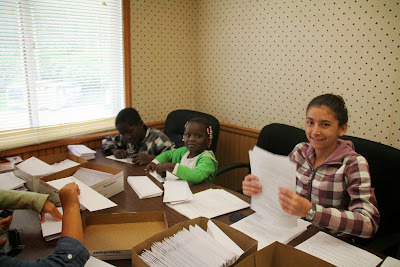 When the kids weren't busy hauling Bibles we put them to work on stamping envelopes. 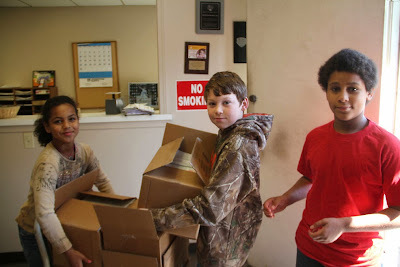 Emily and Logan took the truck to the post office and unloaded the Bibles. I was thrilled when we were finished by noon. We went to Tyrone's for lunch. How thankful I am for such willing helpers. This job would be overwhelming without them. We have ordered 2 more pallets of Bibles and when they arrive will be looking for a group willing to come down to wrap them. Please consider donating a few hours to this program. The pay is out of this world.